Today the Guy, whom you are reading is going to share his journey and some sweet&sour experiences till getting paid his first Adsense Income of 113 USD. 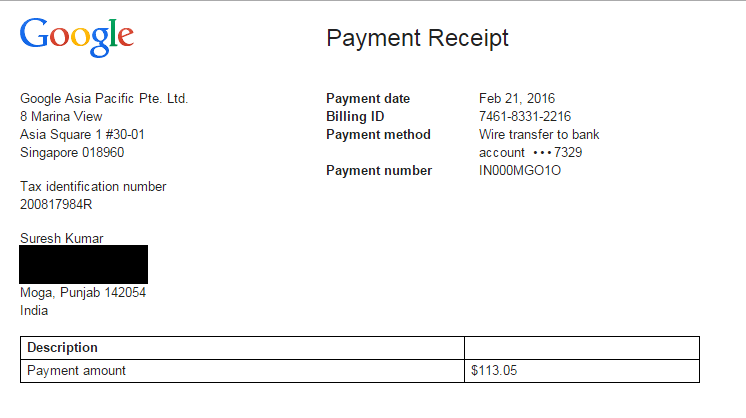 I got Paid this Amount of 113 dollars from Google Adsense on 23rd February 2016. The exact amount that I got paid after conversion into INR was 6762 INR. I think getting paid from Google Adsense is like a dream for every new blogger. I was also one of them. Honestly, when I started my blogging journey I never expected to get paid from Google Adsense. I just thought to write and do blogging to increase the traffic and apply for some cheap Ad networks. I was taunted many a time that I would never be able to get paid from Google Adsense. But finally, with the blessings of God and love of my genuine readers, this month I have proved them wrong. In this post, I am going to share my personal experiences that happened to me. First of all, this post is dedicated to all my newbie fellow bloggers. Also, if you like this post then don't forget to share this post with your friends and also try to link this post on your blogs. This post would be a motivational post. 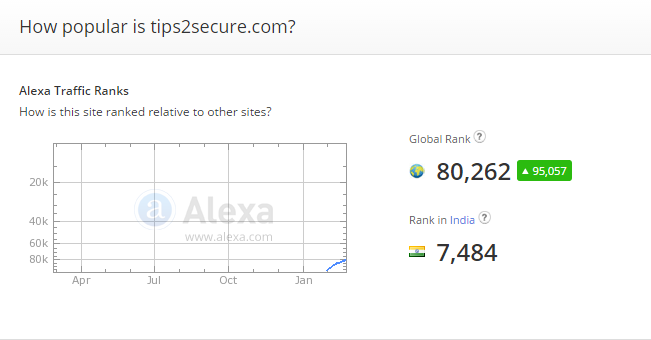 Many of you people know that blog Tips2secure.com had been registered on 8th November 2014. I tried a lot to make success this blog but I always failed. If this blog has gotten this much popularity and love from the readers then I would like to clear that all this happened in just last 3-4 months. 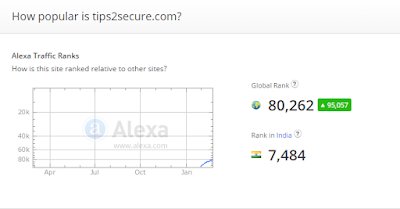 You can check on Alexa that I started getting traffic on this blog just 3-4 months ago. When I registered Tips2secure.com I did not know anything about blogging. You know what, at that time I used to sell hosted Adsense accounts to people to earn money. Honestly, I did not know even how to get approved for hosted Adsense account but I worked for that with the help of a third party. Means the real person who used to approve that accounts and sold to me and charged 200 (4$) INR from me and further I used to charge 500 (9$) INR from my clients, means I was earning the profit of 5$ per account. But after some time I came to know that all the accounts had disabled by Google Adsense team. I left that job of selling hosted Adsense accounts. I created my website on HostGator with .IN domain extension for free. Hostgator gives free .IN domain and hosting for 1 year. They also provide website builder so anyone can create his/her website easily. I also did the same and started selling hosted AdSense account with a youtube channel. I started providing training for youtube monetization. I used to get clients but no clients were able to earn money from Google Adsense at all. I quit that business also. I jumped into MLM business and again I faced a great loss. There was no any hope left with me. I again decided to just focus on my blogging. Because I read many success stories of pro bloggers like Harsh Agarwal, Pradeep Kumar and many more. I started messaging to bloggers for help and to guide me. But all that pro bloggers did not reply me. Nobody was ready to help me. They claim to help their readers in all possible ways on their blogs but in reality but none of them help or even reply to new bloggers. They give importance only to successful bloggers. I was the guy with the education of Arts. I had no technical knowledge and not any experience. Even after my school classes, I chose BBA for my graduation. So, again there was no any technical education. I chose BBA because I wanted to become a businessman, today also it is one of my dreams. I missed a thing here, I am the guy who started the journey of all his online earnings from his simple mobile phone with WAP service of Spice M5252 Model. Even in that model, there was no java. You can read more about this in About Us section. So, I came to know from somewhere how to create a simple Blogspot blog on blogger. After lots of struggle somehow I finally reached when I booked Tip2secure.com. Guys, the main challenge I faced was template editing. It took lots time and sleepless nights to learn all. I forgot to eat and sleeping to learn that. 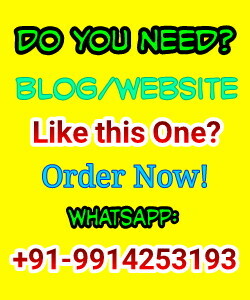 I would also like to tell you one thing, Even today also I am not able to create a blog on Wordpress. Last week I tried but I was failed. But will try someday again. Well, I always love blogger for blogging and also recommend my readers to choose only and the only blogger as their blogging platform. I see many pro bloggers recommending bloggers to migrate their blogs from blogger to Wordpress. But I say the opposite. I always recommend blogger because there are lots or reasons behind choosing blogger as the blogging platform, will discuss the same later. I stopped two or three times working on Tips2secure. I tried a lot to make my blog successful but never been. I again asked some bloggers to suggest me (asked bloggers, not pro bloggers because they don't reply) they suggested me to change my domain name because it contains a numerical number, i.e., 2 and that was why my blog did not rank in Google. I ignored their suggestions. But still there were no results. So I had not any other option except changing my domain. I stopped working on Tips2secure and registered a new domain www.blogandmoney.com (a domain without numerical value). I started writing on the same niche of Tips2secure. I deleted 30 posts of Tips2secure and published it on BlogAndMoney. But again I did not get any result. Then at last 5-6 months ago I decided to not to follow any pro bloggers. I started creating my own strategies for SEO and blogging. I took my final decision to just work on Tips2secure. I again deleted posts from blog and money and published on Tips2secure. You know what, a pro blogger would never share their secret SEO tactics or blogging tips, they just share basic tips to gain readers. If they start sharing their own strategies then there would be lots of competitors for them and do you think anybody wants to have competitors for their own business? Never follow the exact ideas shared by pro bloggers. You should use your own mind also and create some personal strategies. I used some unique strategies and started working according to them. I started getting some results. I think you should read my latest post on What is Important for SEO in 2016? When I saw my blogging started getting 1000 views daily I put Adsense Ads on my blog. Today this blog gets 5,000+ views a day. Adsense also not worked well for me. It took around 2-3 months for reaching their minimum threshold of $100. 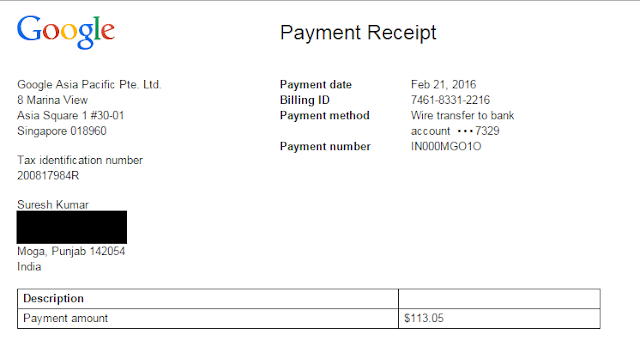 And finally, on 23rd February I got my first payment from Adsense in my bank account. I have been succeeded in completing my one of the biggest dream that was of getting paid from Google. Why Adsense Earnings have decreased by 50-70% in January 2016? Yes, it is true that I was not good at English. But I never left my hope. Then somehow I came to know about Grammarly that helped me a lot. Really Grammarly is playing a very important role in my blogging. I had no ideas of creating and writing daily new content and articles for my blog. I solved it as I decided to write my personal experiences and tutorials. That is the reason I do write sometimes negative reviews of products. Because I never write false wording for products just for money. I can't compromise with quality and readers of my blog. I always love and care, my readers, because I am not a pro blogger. Friends, if you are new to blogging and facing lots of difficulties and challenges then you should never think to quit blogging just keep working. If you are in blogging then don't work for money, work for satisfying your readers. If you would be able to satisfy your readers then money will definitely start growing on your banks automatically. Give at least 1 year in blogging without expecting the results and I challenge you after this period you won't need to think again about should you leave blogging or not? Again if you liked this article then don't forget to share this article and give a link on your blogs. Message: I hope that you have enjoyed 'My Adsense Journey- How I Got Paid First Adsense Payment of $113' article. However, if you want me to deliver more items, then please share my post. You can use Social Sharing Widget provided at the end of every post. After all, Sharing is Caring! Suresh Sir.its nice to here a great motivation for a new blogger like us. I have funny Question to ask as you are in a path to become a "Pro Blogger " you also won't Share your main Techniques with audience like us ?? I don't want to have a title of pro blogger at all. I am guy who write for their readers and here to serve and help my audiences. I will definitely keep sharing all my tactics.. I can't forget my past that what I was...! Yeah sure. I will definitely guide you. Congrats sir...for first payment from Google and for always sharing your Down to Earth Experience.. Very inspiring post. This is really inspiring journey. i am also facing same difficult that you had faced. i am completely agree with your this line " Never follow the exact ideas shared by pro bloggers. You should use your own mind also and create some personal strategies." Thanks for sharing. Nice post, well you may not believe that I have the same experience with my blog. Really pro bloggers never help and never reply you directly, they only share basic tips. Anyways for me I was receiving good amount each day from my technology blog but somehow the adsense account suspended, so right now I am only depending on Affiliates, Media.net (not very high CPC, very very low) and other sponsored advertisements. let me know if we can work together for anything anytime. Hi nice to hear that u got success in what u r trying. Blogging takes time but you will love when it gives back you the desired result. your words resonates me, same here, English is not my native tongue language but it didn't stop to becoming successful in whatever I do. if you don't mind me asking how long you now since started blogging, your Alexa rank seems pretty good. I started 4 months ago now, yes, my rank improves daily. I can't wait to be the number as yours, but of course my main target is to provide quality content. Yes, you are right, some pro bloggers don't share their secrets, but what matter is, your determinationn to succeed, regardless if you walk on your own. congrats on your becoming a successful which I believe you are now. Thanks for posting real story and many blogger face same situation in starting. according to my point of view if you have passion and target then you will definitely get what you want.Blogging is not a easy task but if you work hard then you will be sucess... i am also struggle for my new blog www.airdiginet.com . So first lear and then earn..
Congratulations Suresh, I am also following my own strategies because every pro blogger is busy in getting name, fame and money from all new bloggers but they really don't ready to help bloggers like us. I also created my own blogging empire of 20+ blogs. Some are yet to publish due to lack of content and time and soon I will be sharing a huge list of my own blogs. I also earn a total of $250+ dollars from my all blogs without copying the strategy of other bloggers. Thanks for sharing your blogging journey with the first earned money from adsense ads. "Never follow the exact ideas shared by pro bloggers. You should use your own mind also and create some personal strategies" Really awesome saying from this blog. From heart it motivates it! Yeah, right. Agree with you. I am not not successful at this moment but I am trying. A blogger without passion and dedication is nothing. You're welcome and thanks for sharing your experience here. I'm glad you liked my lines. Thanks for your appreciation bro. I have learnt a lot from you. Thanks for your wishes and blessings. Nice post and you talk the truth. Many pro blogger just publish realtime traffic, page views, adsense income( how much they made with event) and other thing on fb. But you ask for help 1> they not replying to message and if they they try to sell their products or blog coaching. Not only from sponsored posts. It is combination of sponsored posts, affiliate marketing, ebook and personal services selling and now it has crossed 1000 usd. I am targeting keyword that has 40,000 US search volume and cpc RS.4and when i enter keyword in semrush it shows Zero usd. CPC depends on both factors - keywords and countries too. Secondly, volume and CPC of keywords are estimated not 100% accurate. We use this type of analysis just to have ideas nothing more. You can't get exact CPC that are shown by the keyword research tools. I first every landed to your blog and trust me, you are just awesome at writing. i am new at blogging. Love the way you express. Inspiring story for newbies just like me thanks for sharing. I check your blog regularly and always found fruitful. Ya I'm totally agree with your point of view about probloggers. I am glad you liked this post and my point of view. Keep reading this blog regularly for having more amazing articles like this one. Great post man, I really love your start and its very inspiring too. An informative post it was. Thanks for the share! I have a question. I am running a blog at blogger. 3 years ago, I started my blog with a mere motive to 'blogging'. Once, while browsing through settings, I stumbled upon 'adsense'. I registered my account to it. But, being devoid of content (as I was new at blogging tha time), my request got disapproved. Since then, I am not able to get my blog registered with adsense. Is there any rescue to this trouble? Thanks for sharing your experience here with the readers of Tips2secure. You should re-apply for Adsense. Hello , I made an account in Ad-sense maybe 6 month ago , they approved in 2 days . now it still shows 'Hosted account' title , I could apply ads in Youtube but I made a test blog , the ad is not showing there ! why ? You will have to go through the approval process to show ads on your blog. Inspiring the good think is that you are very Frank..... Thanks for the motivational article. bro,i started in wordpress and it is really hard to customize the layout . how to have your own website with blogger? have you made your website without wordpress ?did you purchase the website? how you made the website design and copyrighted it? I always use blogger. Blogger is easy to use and manage. You should give a try on blogger. Receiving first payment from Adsense in really motivating for bloggers. It motivates bloggger to work more and earn more. Very touchy article, really loved it specially because we are on same boat. I just want to tell all new bloggers that there is no secret ingredient to become pro blogger it is just your content. It will grow automatically with time. Patience is the key !